Many New Yorkers know that spending an amazing time in Philadelphia is easy to do. From visiting the birthplace of America to running up the steps of the Philadelphia Art Museum, a la Rocky, the city has much to offer. For those of you who love food, there is now a fabulous place to dine after a day of seeing the sights. It is Zahav. Founded by Israelis, it has become one of Philly's top restaurants. "Zahav" means "gold" in Hebrew, and though a reference to Jerusalem, gold equally describes the quality of the food, service, and ambience you will discover there. Zahav has that casual air of a fine Israeli restaurant, with wide open spaces, high ceilings, rich rustic d?cor in wood and limestone, and a view of the action in the kitchen, supervised by chef Michael Solomonov. Zahav has an excellent selection of wines, but many diners enjoy their specialty cocktails such as Lemonnana, which includes bourbon, muddled mint, fresh lemon and verbena, the Jerusalem cocktail with sparkling wine and sabra fruit, or the Ruby Red Sea with Absolut Vodka, fresh grapefruit, Campari & ginger ale. All are crisp, refreshing ways to relax from a day on the town, as sun settles into dusk and the sensuous joy of dinner among friends commences. Zahav offers a wide choice of salads and hoummus specials. Our server brought us a variety of appetizers to sample, with Zahav's warm freshly baked laffa bread and a wide range of delectable flavors. Among the mezzes that we tasted were haloumi, a Cypriotic sheep's milk cheese with dates and pine nuts, borekas rich with spinach and manouri cheese, and pitriot with royal trumpet mushrooms, eggplant and Bulgarian feta. Zahav's signature dish, whole roasted lamb shoulder grilled slowly over coals and braised in pomegranate juice over Persian rice, is not to be missed. The portion was huge, flavorful, and melted in our mouths. This dish is offered exclusively as part of the Mesibah ("Party Time") tasting menu, which also includes salatim, hoummus-tehina and laffa, a selection of mezzes, and dessert. At $42 per person, this full tour of the menu, with a wide range of deftly executed flavors, will certainly please, and is definitely the best way to experience why Zahav has earned its reputation as a culinary star that is both sophisticated and approachable. There was much more to choose from, many with Israeli names including Yemenite soup, Jerusalem Grill (grilled duck hearts, dirty rice, and pine nuts), the Sabra (young chicken, mujadara, and green tehina), the Farsi (duck two ways, Persian rice & pistachios), the Haifa (grilled sea bream, spicy chickpeas, spinach, and tomato), or the Galil (eggplant, tomato couscous, asparagus, and tehina). Be certain to leave room for dessert. Always a perfect way to end an evening of fine dining with family, friends, or that special someone, dessert at Zahav finishes the meal with delicate and incomparable richness. We dined on halvah, mousse, poached fruit, and baklava, as we equally savored the experience and pledged to return. As we glanced around the room throughout the evening, guests were smiling, engaging in conversation, and simply enjoying a great night out, at what is a truly great restaurant. 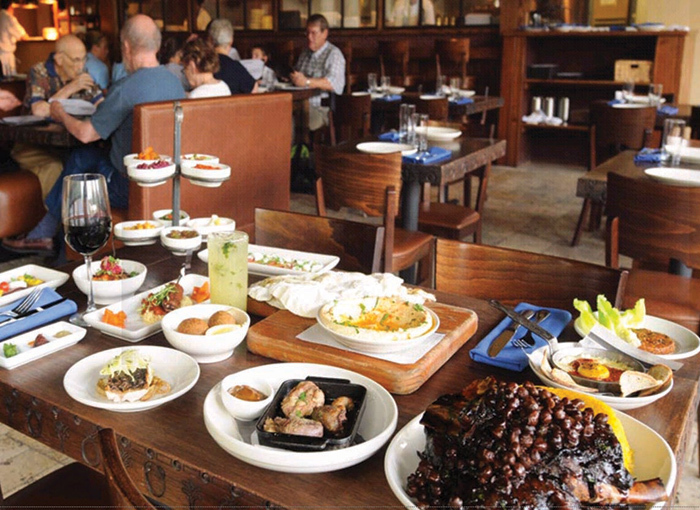 If you can't spend next year in Jerusalem, consider a trip to Philadelphia one weekend to experience the gold-medal experience that is Zahav. Zahav is at 237 St. James Place, in a quiet corner of Society Hill just a few short blocks from many of Philadelphia's top sights. One should certainly call for reservations. For more information, call (215) 625-8800 or see www.zahavrestaurant.com.